Police are appealing for information after a defibrillator was stolen from outside a shop in Newtownabbey. The life-saving piece of equipment was taken from the Spar at Kings Crescent over the weekend. The defibrillator was stolen on Sunday. A PSNI spokesperson said: “This occurred sometime between 2am and 6am on Sunday, October 21. Anyone that was in the area at the time and observed any suspicious activity should make contact with Newtownabbey police. “The item has since been recovered, but the picture shows what would have met anyone looking for this potentially life-saving piece of equipment - an empty cabinet. “The defibrillator is a valuable item which was paid for by the local community and is for the benefit of the local community. “The consequences of removing this item could have a serious impact on anyone in need. 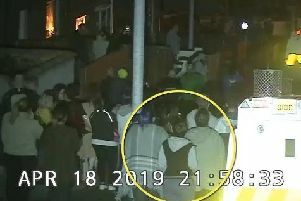 Condemning those behind the incident, Macedon DUP representative, Cllr Thomas Hogg MBE said: “I am appalled to learn of the theft of the defibrillator from Kings Crescent shops. This life-saving equipment is a vital asset in the event that a member of the public suffers cardiac arrest. “It is some relief that this equipment has since been recovered, however those responsible have risked the lives of local people through their mindless actions.